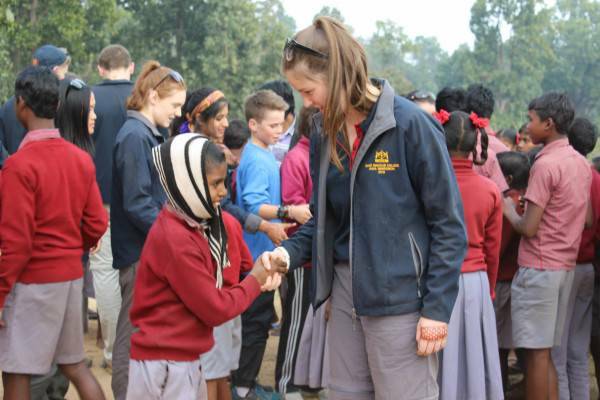 During December 2013 the India Immersion group embarked on a journey across India, encountering the poorest of the poor and conditions of living not easily experienced in suburban Adelaide. The highlight of the immersion for many was our first destination, Chennai. Here we stayed in Mithra, a home for intellectually and physical disabled persons. We were faced with one of the hardest parts of the journey; long hours of work, constant attention and having personal space invaded which is something few of us are used to. However Mithra is a special place and the hard work was rewarded with lasting memories and great friendships formed. The residents were happier than most who have far more material possessions, and it seemed that they taught us more than anything we could show them. After an extended stay in Chennai, we visited Delhi, Jaipur and Agra. Although 'tourist' sites, one never really leaves the immersion in India with all of the senses constantly assaulted. We were fortunate to also visit Varanasi the most holy city in India. There is no doubt that the group felt a strong sense of spirituality and faith in the atmosphere whilst we were there. We saw locals bathing and washing in the River Ganges an act which signifies the washing away of sins and witnessed the Burning Ghats where cremations take place. This was definitely an overwhelming and powerful experience. We were privileged enough to stay at St Xavier's College in Hazaribag, a Jesuit school which is virtually identical to Saint Ignatius' College. Whilst staying there we were billeted for a night with Year 11 students from St Xavier's. Experiencing the life of an Indian teenager was easily one of the major highlights of the journey. Our final stop was Kolkata. Here we visited Mother Teresa's House several times and worked with the inspirational Missionaries of Charity. The girls visited Shanti Dan (meaning House of Peace) and the boys visited Nabo Jibon (meaning New Life). Although we were separated at different houses in completely different areas we still performed similar services such as cleaning/washing, playing and communicating with the adults and children as well as feeding them. This was definitely a very rewarding experience and challenging way to end the immersion. The experiences we encountered in India will remain within our hearts and minds forever. We will never forget the amazing people we met, the beautiful faces we saw on the streets, the fascinating culture and architecture of India and the special bond we have built within our group. Alessandro Borello has learnt to be more appreciative of the opportunities he has been granted in life after visiting Mithra, a rehabilitation centre in Chennai, where he helped staff to teach and care for physically and intellectually disabled children, many of whom had been orphaned. Alessandro ended up learning an important life lesson from the children he was there to help teach. "I was so sad for them, to think that they wouldn't have the opportunity to go much further than where they were, but then then I realised that they were still so happy. They have so little but they're so content; we have so much but we still want more," Alessandro said. Alessandro feels grateful for the experience he gained from the trip which allowed him to put his situation into perspective and be more content about how fortunate he is. "The trip really opened my eyes and showed me in perspective how much we have, how much we want and how much we get, and the opportunities that are available to us. "I also found that material things aren't always the answer. Sometimes the best thing you can do to help a person in need is just to spend some time with them." Alessandro said. The Indian Immersion is a part of Saint Ignatius' College's wider Social Justice Program which focuses on educating students to be men and women of service who are religious, loving and committed to justice.